The last hurricane knocked out our electricity for 3.5 days. (Other people in our neighborhood were without power for 6+ days). I have a 120 volt inverter that I used to power our fridge, microwave and internet, but our well pump requires 240 volts. It was really annoying to have to transfer water from our tub to the toilet tank to flush, and not be able to wash our hands at the sink or get water from the tap when we wanted to. My wife has given me a $1,000 budget to expand our backup system so that we can run the well pump in power outages, and the first step is to figure out the actual power draw of the well pump. The pump is powered off of a 20 amp circuit, so the maximum draw is 240v * 20A = 4,800 watts. I measured the actual continuous draw when the pump is running at just under 10 amps, or 10 * 240 = 2,400 watts continuous. I will probably need to purchase an inverter with a surge rating of twice that to support the inductive surge the pump motor is likely to draw when it first turns on. I hooked up an energy monitor to the pump circuit and monitored it for a few weeks. The energy monitor estimates that the well pump uses between 6-8 kWh of power over the course of a month, so I will only need 1-2 kWh of battery capacity to be able to run it for several days. I decided that although there are a lot of advantages to sticking with a 12 volt system (wide selection of chargers/inverters, lots of 12v accessories, easy charging from auto systems), the fact that I was going to be building a relatively high power system (with an inverter able to continuously drive 2,500 watts and intermittently go a lot higher) meant that I needed a higher voltage battery so that the amount of amps going through my battery wiring and inverter was kept at a reasonable level. Although my electric truck regularly has peak power draws of up to 500 amps, it uses 00 welding wire to handle that. I also decided that although you can generate high power output from a 12 volt input, I wanted to buy an inverter that was designed by somebody to take advantage of a higher voltage supply. For anybody following along, for an occasional use backup power system, I still think that lead acid golf cart batteries are a great choice. Although they are old technology, and limited to only 300-500 cycles, if you are only using them in power outages (as opposed to powering your off grid house every day) it is hard to beat the cost advantages of a flooded lead acid golf cart battery. However, because I want my battery to be dual usage (powering a boat when not preparing for a hurricane), weight was also a factor for me. 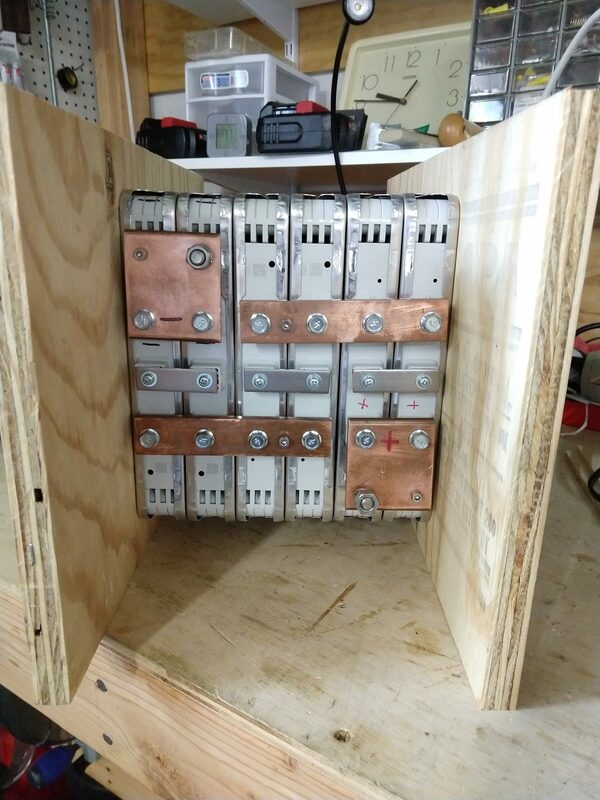 And due to my experience converting my electric S-10 truck from lead acid batteries to use Nissan Leaf modules, I have a lot of experience in taking used Nissan Leaf battery modules and making use of them. Because they are used, the actual cost is almost comparable to new golf cart batteries, but they do introduce complexity due to their need for a BMS system in unattended usage scenarios. After doing a lot of research, I decided that the best bet for a sub $400 inverter to power my well pump was the PowerJack 8000W model. Like all Chinese inverters sold in this price range on eBay, the 8,000 watt specification is completely suspect, but I am hopeful that due to it’s low frequency nature, it will be able to start up and run my 2,500 watt well pump. The 2,500 watt draw is intermittent, giving the MOSFETS and transformer a lot of time to cool off between runs. We’ll find out soon enough….. I used the same basic battery construction method as for the eight batteries I made for my S-10 Truck conversion, but instead of making them 3P2S for 16 volts at 180 AH, I made it 2P3S for 24V at 120 AH. If you want to download the templates I used for the holes in the bus-bars you can download the PDF file here: BusBars.pdf. I used 1/4″ holes for the M6 bolts on the Leaf Modules, 9/16th holes to tap for a M4 socket head cap screw for the sense terminals, and 17/64th holes to tap for a 5/16th bolt mounted from the underside for the terminal lugs. In this next video, I show all of the circuit breakers, cell voltage sensing leads, meter, connectors and pre-charge circuit that I added to the above physical battery to make it safer and easier to use. I had to repair part of my Power Jack inverter straight out of the box (They shipped me the parts under warranty in 7 days). After replacing a MOSFET board that was lacking an indicator light, I tested it out with various 120v appliances around the house, and found that it was a quite capable inverter and was able to power everything that I would normally plug into a 15 amp household outlet. The video above shows how to open up the case, do the MOSFET replacement and the tests I performed. The inverter powered the well pump just fine as long as the input voltage was at the upper end of that provided by my LiIon battery (24-25 volts). There would be a very brief initial current surge when the motor started up (well under a second, not easily detectable my the slow averaging meters), but it would drop to an average load of 2000 watts (85 amps at 24 volts) for the remainder of the 30-45 second pump runtime. However, as soon as the battery pack started to be depleted and the input voltage started to drop into the 22-23 volt range under load, the well pump would no longer start up (even though the battery was sourcing 200+ amps / 5,000+ watts to the inverter for multiple seconds before the 200 amp circuit breaker would kick in). I suspect if I had a 7S battery pack (instead of the 6S I currently have) the higher voltage would allow the inverter to start the well pump for a lot more of the pack capacity. But, as I was always planning on “topping up” this smaller battery pack from my trucks 24kWh pack (at 130 volts DC), I don’t think that this will be a showstopping issue. I can keep the small battery pack charged up in the 24-25 volt range, and use it to provide the high current surges (200 amp startup, 85 amp running) for the intermittent usages such as the well pump, while constantly replenishing it with a 20 amp input from the MeanWell SD-500-24 converter that I’ll be using to charge it. I cut out some plywood to make an enclosure for the power supply and wired up connections that allow me to power it from my trucks’ battery pack. I have a 15 amp DC rated fuse on the line from the truck, and I’m relying on the 40 amp circuit breaker in the battery for the output side protection, as the XT60 connector is wired right to the power supply. Unfortunately, this is a power supply, and not a battery charger, so it refuses to push 23 amps continuously, and if it detects a high amp draw (above it’s 21 amp limit) it will shut itself down after a few seconds. (Requiring one to remove input power and re-apply to reset the power supply). So while I can use it to keep the battery topped up (or even charged if I’m willing to babysit the voltage output level as the battery gains charge), it will automatically shut itself off if the voltage level on the battery drops a half volt or more such that more than 23 amps are drawn from the power supply. The solution to this is a current limiting device between the power supply and the battery, which allows current to flow as long as it is lower than 20 amps, but puts a limit on the upper bound of current that can be drawn (for example, when the inverter draws 80-300 amps to start up and run the well pump). There are several ways to do this: 1. Tie into the existing current limiting/sensing and voltage regulation circuitry in the power supply. 2. Introduce a PWM current limiter between the PS and battery. 3. Introduce some resistance between the power supply and battery to limit the current flow. Option 3 is the easiest, but also the most inefficient, as it may waste a lot of power. Option 1 may require the most work (in reverse engineering the PS) and it voids my warranty. Option 2 is nicely self contained, but does required building a whole new device. I have a unique situation in that I only need the power supply to “top up” the battery, so that most of the time, the difference in voltage between the power supply and battery will be very small, so only a small amount of current will flow between them. I’m going to take advantage of a passive variable resistor device that has relatively low resistance when the voltage difference across it is low, and increasing resistance (up to 5x as much) as the voltage difference across it raises. In this way, when the battery voltage is close to the charger voltage, it will waste little power, but when the inverter turns on and the battery voltage sages, the higher resistance will limit the total amp draw to under 20 amps, which the charger can provide. As an added side benefit, these devices act as an indicator that shows when they are limiting current. The only downside to these devices is that they come in certain fixed voltage / resistance configurations, so to get the specific resistance I need I will need to put multiple in parallel. This entry was posted in Projects by Jay. Bookmark the permalink.